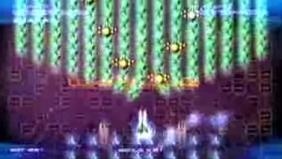 A developer for Galaga Legions has revealed the coveted secret of how old-school arcade games remain entertaining while modern games quickly fade: unique gameplay that can't be touched by technological advancements. Namco Bandai's been on a nostaglic gaming binge as of late, with Tadashi Iguchi leading the company's 80s remakes effort. His arcade love affair led him into the position of directing the company's recreations of Pac-Man and Galaga for the Xbox Live Arcade. His games, Pac-Man: Championship Edition and the upcoming Galaga Legions, are meant to be "reconstructions" of the old formulas, with the Galaga game more of a "mutation" than Pac-Man: CE due to Pac-Man creator Toru Iwatani's oversight on their first project. "95% of our new ideas that were turned in were rejected by Mr. Iwatani! For the only one that passed, the idea of the 'Map Clear Rule' to play the game non-stop, we really negotiated with him and made him understand what we would like to achieve," explained Iguchi. Trying to improve franchises that have already influenced nearly every game in the past few decades is a task Iguchi and his team took very seriously. "We first divided each element of the original game, talked it over with the team and changed the parts so that it fits modern gameplay conditions, then we put it back together," he said. "We used the same method for Pac-Man C.E.. We didn't try to make only the looks or visual effects better, but since we remade it from the ground up, I think people recognize that it's different from more traditional remakes." Iguchi sadly doesn't believe that future developers will be able to update modern games in the future. "I think more than half of the games you see today with huge budgets and such a 'realistic' focus will be either stale or forgotten in 20 years," he said. "On the other hand, the masterpieces of the 80's will definitely be enjoyed far into the future. The reason for this is simple - many of these classic titles have unique and fascinating mechanics that can't be diminished by the advancement of technology."